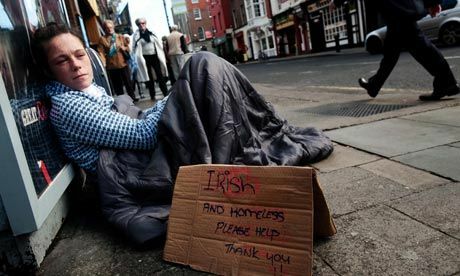 Tens of thousands of Irish people descended on Dublin over the weekend in protest at the Irish Government’s severe economic policies – slashing the minimum wage; cutting unemployment benefits; raising VAT to 24%; raising property tax and much more. However there was no attempt at raising corporate tax, which is amongst the lowest in Europe at 12.5%. The message is loud and clear, ordinary Irish people will have to pay for Ireland’s economic mess, while large multinational businesses will get off scot-free. Let’s briefly remind ourselves of how Ireland got into this mess. Their banks gambled…heavily, and lost. They gambled because the Irish Government (Fianna Fail) let them gamble. As the realisation dawned of the mounting losses the Irish Government, in a promise to guarantee everybody’s savings, essentially nationalising their banks and placed the banks’ losses on the Government’s books. The economy continued to flounder, growth was negative, the building industry (on which Ireland built much if not most of its economy) collapsed; people lost their jobs; tax receipts fell. Consequently the Irish Government couldn’t repay their adopted debts either. The IMF, the EU, and the UK have come to their rescue and lent them a whopping £77bn bailout. Good on them! Or is it? Well, no actually. Firstly the Irish Government were insistent that they didn’t need a bail-out. But reports inform us that the Irish Government were ‘forced’ to accept the bail-out and introduce the draconian economic measures noted at the top of this article as a condition of the bail-out. But there was another option. The Irish could have defaulted. The consequences of defaulting would not be nice either, though recent history shows us that both Russia and Argentina defaulted in the recent past and after very bleak couple of years returned to growth (though the means to achieve that growth, in Russia’s case especially, is up for speculation). Both defaulting and accepting a bail-out would hurt ordinary people. But at least with the default option it would be the sovereign government’s choice as to what economic measures should be introduced to help aid growth. By accepting the bailout they have ceded decision making on behalf of their people to a foreign government who is not introducing policies with the best interests of the Irish people at heart, but in the interest of maintaining the Euro and European Financial Markets. Also in both Argentina and Russia, and in Iceland’s case as well (though Iceland accepted a bailout rather than defaulting), each of them had greater control over their immediate economy by being able to devalue their currency to assist growth. Ireland, being tied into the Euro, cannot do this. Why has the IMF, EU and the UK insisted on a bail-out? It seems that the level of interdependence between banks and financial organisations is such that an Irish default would lead to market confidence falling drastically in other financial centres, including London. Defaulting on behalf of Spain, if they chose to do so, would almost certainly bring down France and the UK. If Ireland were to default confidence in Portugal and Spain would collapse. The cost of having to bail these countries out would be a colossal €600bn. A Spanish bailout would cost the UK several tens of billions of pounds, money which the Chancellor George Osborne says isn’t available to stimulate the UK economy, so in theory is not available to help stimulate anybody else’s economy, (though where he got £7bn to help Ireland from only he can tell…unless someone’s telling porkies and there is money available! Shock horror!). Such a massive bailout would probably destroy the Euro and threaten the whole viability of European economic institutions. So in order to stop a domino effect across the EU, the Irish have to pay out excessively to shore up the market’s confidence. The sad fact is that none of this is accurate science and market confidence is based on speculation. In the mean time the people of Ireland are having to pay for our collective greed.